Day 1 – Down on the river a common loon leisurely swam near the shore; the bird would occasionally float with its head submerged as if it was looking for fish, but never completely submerged. 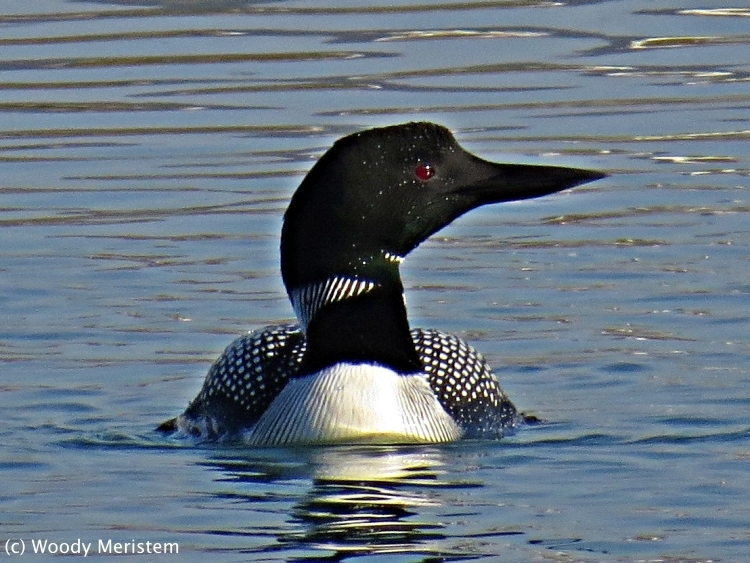 Loons winter along the Atlantic coast and breed on northern lakes and large ponds. Although, on rare occasions, these loons have bred in Pennsylvania and non-breeders occasionally spend the summer here, we normally only see them as the pause on their way north; years ago a co-worker and I counted 104 common loons on a large local lake on a single day. Day 2 – Went to State Game Land #252 looking for waterfowl on the ponds. Other than the resident Canada geese, some already incubating eggs, there were few birds on the ponds. High in a tree a flash of red caught my eye – the brilliant red crown and nape of a red-bellied woodpecker. 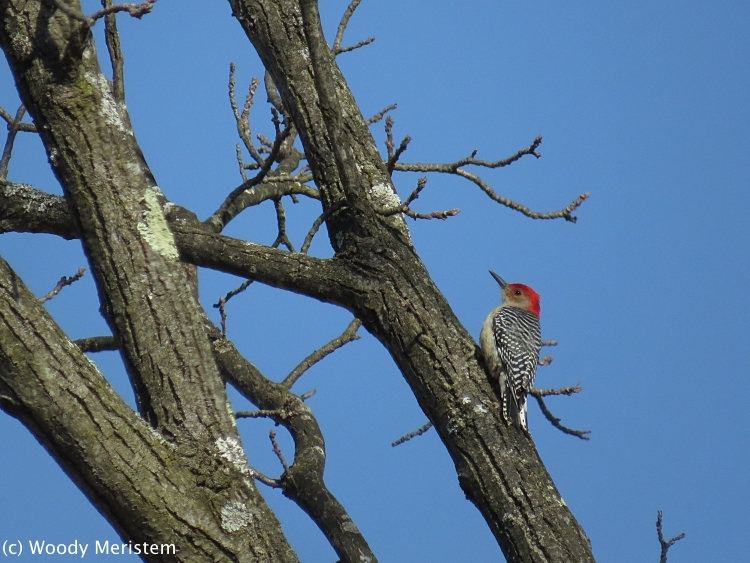 Decades ago red-bellied woodpeckers were a bird of southern woodlands, but as the climate has changed they’ve expanded their range northward and are now common here. Day 3 – I was walking along the edge of a small wetland edged by a narrow band of cattails when a large bird flushed from the cattails, flew across a narrow band of open water and landed in the top of a large patch of red-stemmed dogwood. 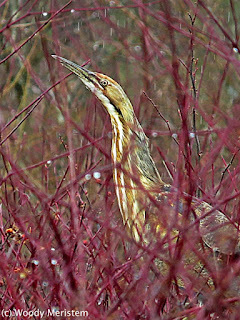 There it stayed as I took photo after photo – it was an American bittern, the first I’ve seen here in many years. 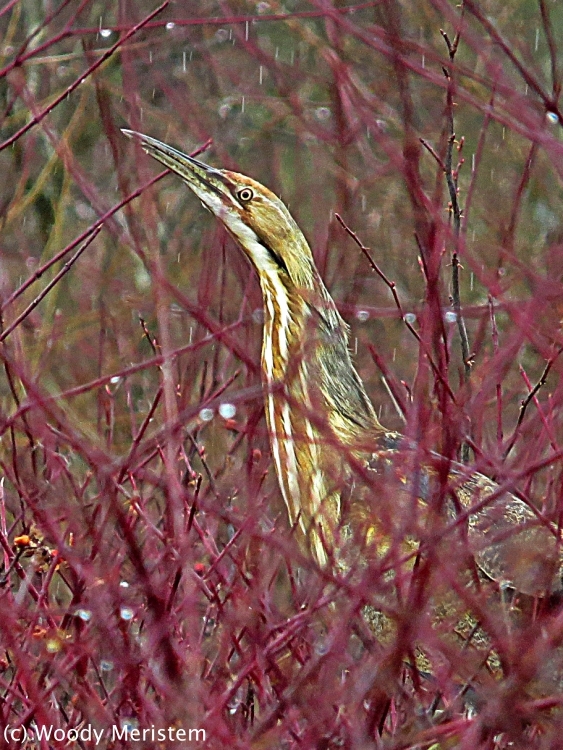 American bitterns prefer extensive cattail marshes and, due to habitat loss, are endangered in Pennsylvania so it was a very lucky find. Day 4 – There are quite a few old homesteads in the Big Woods, places where families lived and farmed until a changing economy made their life styles untenable and the farms were abandoned. While they lived on their farms those folks often planted flowers and flowering shrubs: lilacs, columbine, myrtle, irises and daffodils – some of which survive to this day. Alongside an old stone foundation remaining from one of the farmsteads was a clump of daffodils with its flower buds beginning to open. Day 5 – Along the Pine Creek rail-trail a tiny white flower was in bloom – hairy bittercress is its common name. The entire plant is small, growing only about one and a half inches tall and very easy to overlook. Hairy bittercress is native to Europe but has been inadvertently carried throughout the world by settlers and travelers. It’s said to be edible and was used as a green in salads. Day 6 – It was 70ºF today and, in spite of a stiff breeze, it felt quite hot. 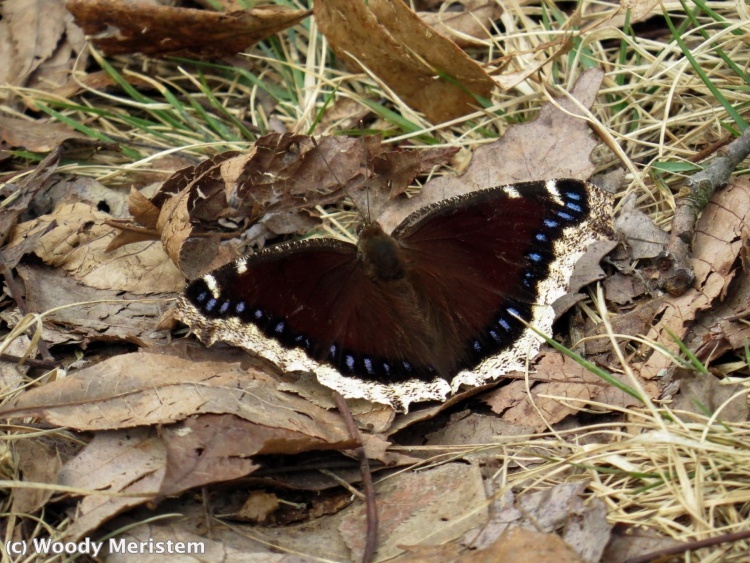 Along a woodland trail, a mourning cloak butterfly flew lightly among the trees until it finally landed on the trail. Mourning cloaks spend the winter as adults beneath loose bark, in the leaf litter or in hollow trees, emerging on warm days in spring to feed on tree sap. On those warm spring days the males bask in sunny spots on the forest floor waiting for females so they can mate and produce the next generation. Day 7 – Along an old road in the Big Woods are some decaying chunks of firewood that were cut and never removed. The decaying chunks are habitat for worms, slugs, fungi, insects of many species and salamanders. You can never tell what may be found if the chunks are carefully lifted. 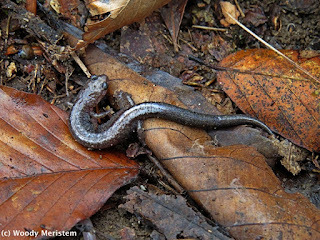 On this day it was a red-backed salamander (the variety with a lead-colored, not red, back). Red-backed salamanders are the most abundant vertebrate in our damp woodlands. Because they’re lungless and breathe through their skin they must live in moist places: in the leaf litter, beneath logs and rocks or in burrows in the soil. The camera trap along the rim of the plateau has been in the right place at the right time for a number of months. Earlier videos were in previous posts – the one with the bobcat trying and failing to catch a gray squirrel was especially satisfying. The jumble of boulders, outcrops and overhangs on the steep slope below the camera seems to be prime habitat for one or more bobcats; a photograph or video of a bobcat has been on the camera’s memory card at every check. The rabbit in this video may well be an Appalachian cottontail since the site’s elevation and habitat, which contains significant amounts of mountain laurel, huckleberries and blueberries and a few conifers, are those preferred by these rabbits. Appalachian cottontails are a species of concern in Pennsylvania; white-tailed deer compete for the browse that the rabbits rely on for winter food and eastern cottontails compete for summer foods. Unfortunately, without a DNA test there’s no way to know if it was an Appalachian cottontail or just a wayward eastern cottontail in a large area of dense woodland. The white-footed mouse that ran down the branch stub didn’t hang around for long – a wise move with the bobcat paying regular visits. Eastern coyotes form lifelong pair bonds and the pair in the video appeared at the peak of breeding season – in mid-February on a foggy morning after a freezing rain. These weren't the first coyotes caught by a camera at this site. The rim of the Allegheny Plateau has been a productive place for a camera trap, what will the future hold? A raven was perched in a tree long the edge of a winding country road, as the car approached it took flight to slowly fly in a tight circle through the forest. The car came closer and still the raven circled, seemingly reluctant to leave. The car stopped and I opened the window in hopes of getting a photograph of the raven. No such luck, stopping was more than the raven would tolerate and off it went. Here was an opportunity too good to pass up. The next day, after another snowfall, I returned to put up a camera trap in hopes of getting videos of the raven and document other species that came to recycle the dead raccoon through their digestive systems. The animals and birds that appeared in the video: southern flying squirrel, red fox, raccoon, white-footed mouse, fisher, red-tailed hawk, common crow. And – No the raven never returned. Several of us were in the coffee shop talking about the history of the Hepburn Street Dam in the West Branch of the Susquehanna River at Williamsport, Pennsylvania. The original dam, built in the 1850s to create a large stillwater for the storage of logs, was constructed of timber cribs filled with rock; the new dam, of concrete, was constructed in the 1980s to replace the old deteriorated dam. On the concrete dam is a sign mandating that boaters stay at least 100 feet from the “boil” on the downstream side of the dam. The boil is that foaming mixture of air and water that forms as water flows over a low dam. Because the boil is a mix of water and air (up to 30% of the boil is composed of air bubbles), it provides minimal buoyancy and makes low-head dams a significant hazard. 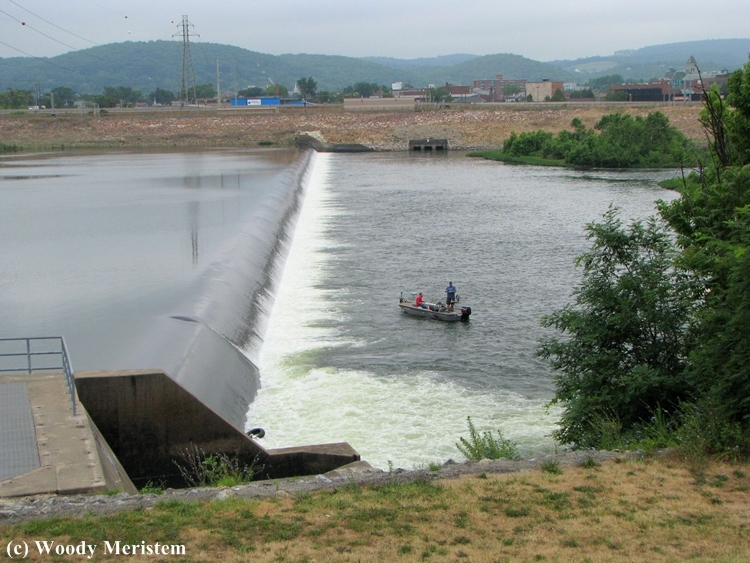 Three people died in that incident in the 1970s and two died last year at a similar dam in Harrisburg, Pennsylvania (at least 29 people have reportedly drowned at that one dam). 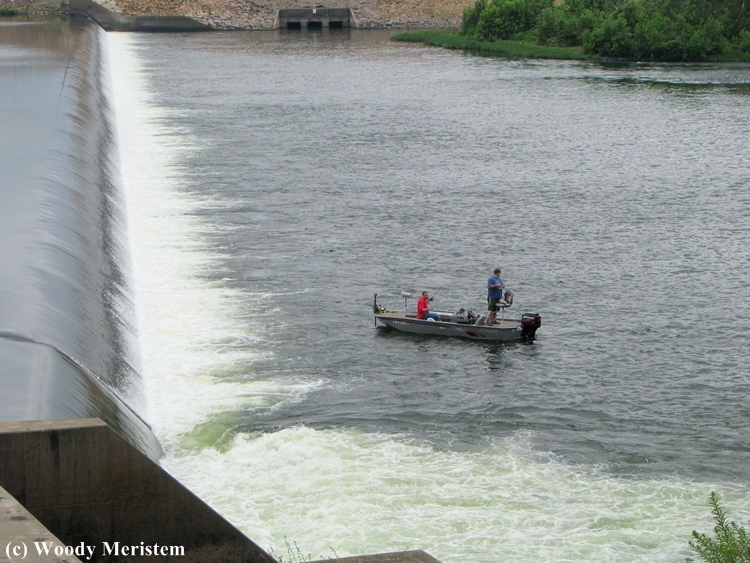 People drown in the boil of low-head dams almost every year – be careful.